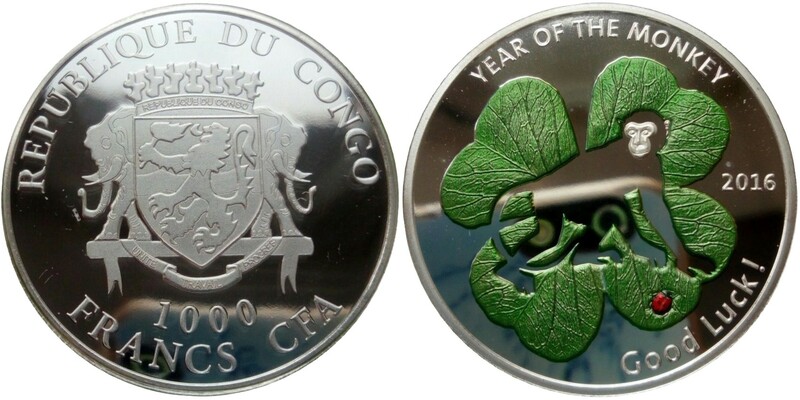 CONGO 1000 Francs CFA 2016 – Année du Singe : bonne chance – 20 g Argent 999 Proof – 5000 exemplaires – diamètre 40 mm – prix ignoré. CONGO 1000 Francs CFA 2016 – Year of the Monkey : Good Luck – 20 g 0.999 silver Proof – mintage 5,000 – diameter 40 mm – unknown price. POLOGNE 50 Zloty 2017 – Sigismund l’Aîné – 62,2 g Argent 999 UNC – 6000 exemplaires – diamètre 45 mm – prix 160 euros. POLAND 50 Zloty 2017 – Sigismund The Elder – 62.2 g 0.999 silver UNC – mintage 6,000 – diameter 45 mm – price $183. POLOGNE 20 Zloty 2017 – 100 ducats de Sigismund Vasa – 28,28 g Argent 925 Proof (plaqué or) – 18 000 exemplaires – diamètre 38,61 mm – prix 45 euros. POLAND 20 Zloty 2017 – 100 Ducats of Sigismund Vasa – 28.28 g 0.925 silver Proof (gilded) – mintage 18,000 – diameter 38.61 mm – price $51. BULGARIE 10 Leva 2017 – Khan Tervel – 23,33 g Argent 925 Proof – 3000 exemplaires – diamètre 38,61 mm – prix 34 euros. BULGARIA 10 Leva 2017 – Khan tervel – 23.33 g 0.925 silver Proof – mintage 3,000 – diameter 38.61 mm – price $38. ILES COOK 5 Dollars 2017 – Cacatoès rosalbin – 20 g Argent 925 Proof (ailes en 3D) – 2500 exemplaires – diamètre 38,61 mm – prix ignoré. 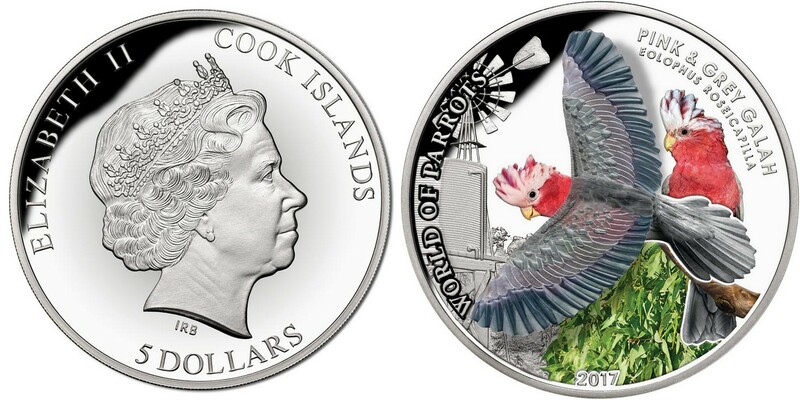 COOK ISL 5 Dollars 2017 – Pink & Grey Galah – 20 g 0.925 silver Proof (3D Wings) – mintage 2,500 – diameter 38.61 mm – unknown price. ANGLETERRE 2 Pounds 2017 – Licorne d’Ecosse – 31,21 g Argent 925 Proof – 6250 exemplaires – diamètre 38,61 mm – prix 97 euros. GREAT BRITAIN 2 Pounds 2017 – Unicorn of Scotland – 31.21 g 0.925 silver Proof – mintage 6,250 – diameter 38.61 mm – price $111. NIUE 10 Dollars 2017 – Florin de Canberra – 155,5 g Argent 999 Proof – 500 exemplaires seulement – diamètre 65 mm – prix observé 353 euros. 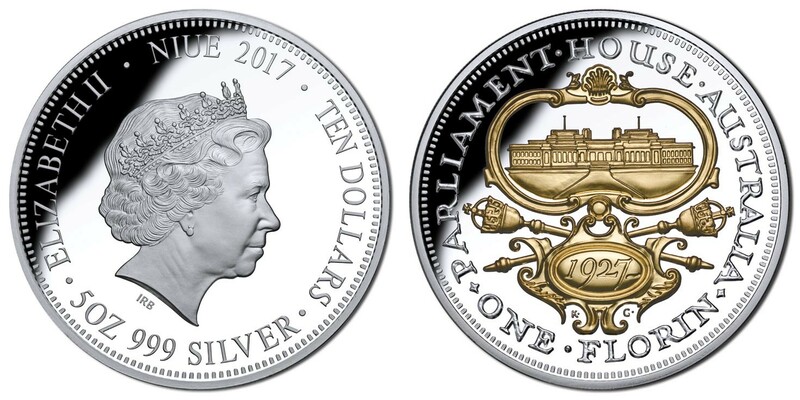 NIUE 10 Dollars 2017 – Canberra Florin – 5 oz 0.999 silver Proof – mintage 500 pcs only – diameter 65 mm – observed price $403. TOKELAU 1 Dollar 2017 – Diana Princesse de Galles – 20 g Argent 925 Proof – 1961 exemplaires – diamètre 40 mm – prix observé 67euros. TOKELAU 1 Dollar 2017 – Diana Princess of Wales – 20 g 0.925 silver Proof – mintage 1,961 – diameter 40 mm – observed price $76. TOKELAU 10 Dollars 2017 – Diana Princesse de Galles – 155,5 g Argent 999 Proof – 500 exemplaires seulement – diamètre 65 mm – prix observé 353 euros. TOKELAU 10 Dollars 2017 – Diana Princess of Wales – 5 oz 0.999 silver Proof – mintage 500 pcs only – diameter 65 mm – observed price $403. TUVALU 1 Dollar 2017 – Ghostbusters : fantôme – 31,1 g Argent 999 BU – 5000 exemplaires – diamètre 40,6 mm – prix 70 euros. 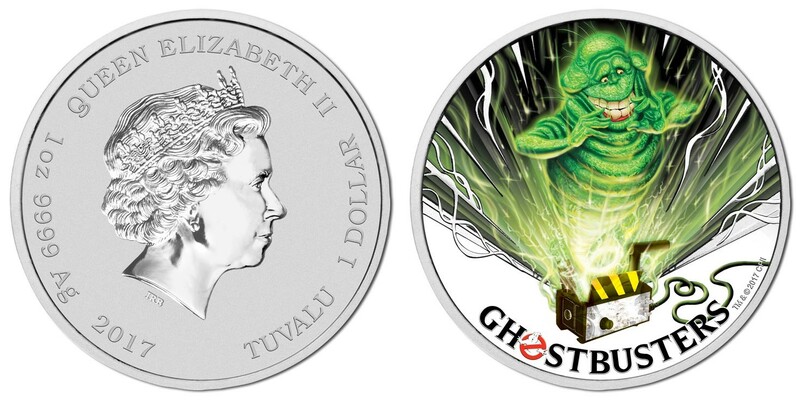 TUVALU 1 Dollar 2017 – Ghostbusters : Slimer – 1 oz 0.999 silver BU – mintage 5,000 – diameter 40.6 mm – price $80. TUVALU 1 Dollar 2017 – Diwali festival – 31,1 g Argent 999 BU – 5000 exemplaires – diamètre 40,6 mm – prix 48 euros. 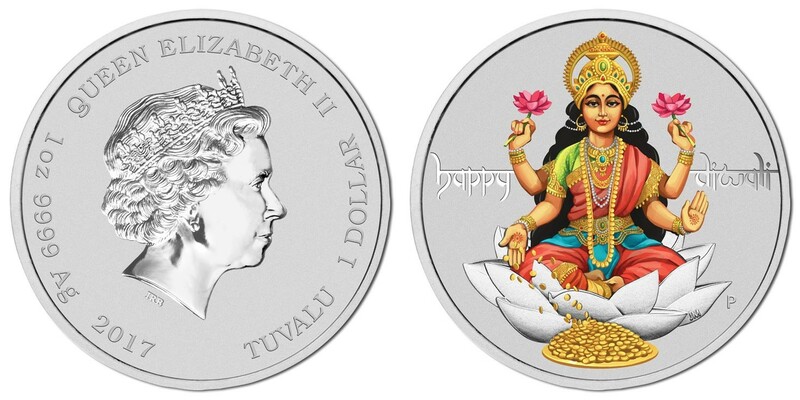 TUVALU 1 Dollar 2017 – Diwali Festival – 1 oz 0.999 silver BU – mintage 5,000 – diameter 40.6 mm – price $55. AUSTRALIE 1 Dollar 2017 – Aigle pygargue – 31,1 g Argent 999 Proof – 5000 exemplaires – diamètre 40,6 mm – prix 61 euros. 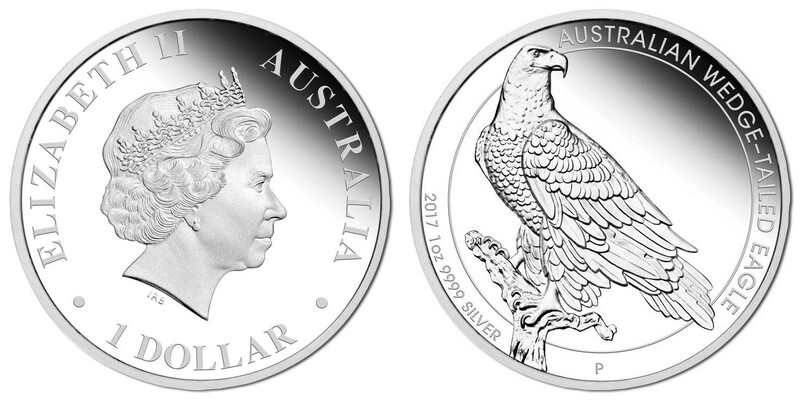 AUSTRALIA 1 Dollar 2017 – Wedge-Tailed Eagle – 1 oz 0.999 silver Proof – mintage 5,000 – diameter 40.6 mm – price $69. AUSTRALIE 1,85 Dollar 2017 – Set kangourou – 57,54 g Argent 999 Proof – 3000 exemplaires – diamètres varies – prix 134 euros. AUSTRALIA 1.85 Dollar 2017 – Kangaroo Set – 57.54 g 0.999 silver Proof – mintage 3,000 – various diameters – price $153. AUSTRALIE 1 Dollar 2017 – Phoenix & Dragon – 31,1 g Argent 999 Proof (haut relief) – 5000 exemplaires – diamètre 32,6 mm – prix observé 73 euros. 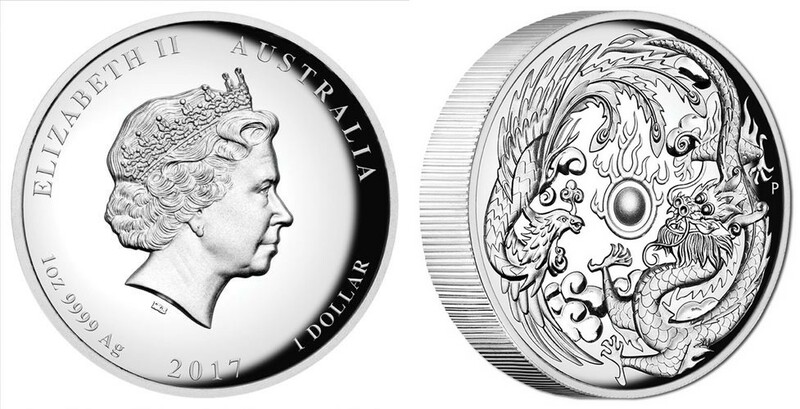 AUSTRALIA 1 Dollar 2017 – Phoenix & Dragon – 1 oz 0.999 silver Proof (high relief) – mintage 5,000 – diameter 32.6 mm – observed price $84. NIUE 1 Dollar 2017 – Siècle de vol : Hindenbourg – 31,1 g Argent 999 Proof – 400 exemplaires seulement – diamètre 37 mm – prix 55 euros. NIUE 1 Dollar 2017 – Century of Flight : Hindenburg – 31.1 g 0.999 silver Proof – mintage 400 pcs only – diameter 37 mm – price $62. NIUE 1 Dollar 2017 – Siècle de vol : Lindbergh – 31,1 g Argent 999 Proof – 400 exemplaires seulement – diamètre 37 mm – prix 55 euros. NIUE 1 Dollar 2017 – Century of Flight : Lindbergh – 31.1 g 0.999 silver Proof – mintage 400 pcs only – diameter 37 mm – price $62. NIUE 2 Dollars 2017 – Footballeur Jan Koller – 29 g Argent 999 Proof – 500 exemplaires seulement – diamètre 40 mm – prix 57 euros. 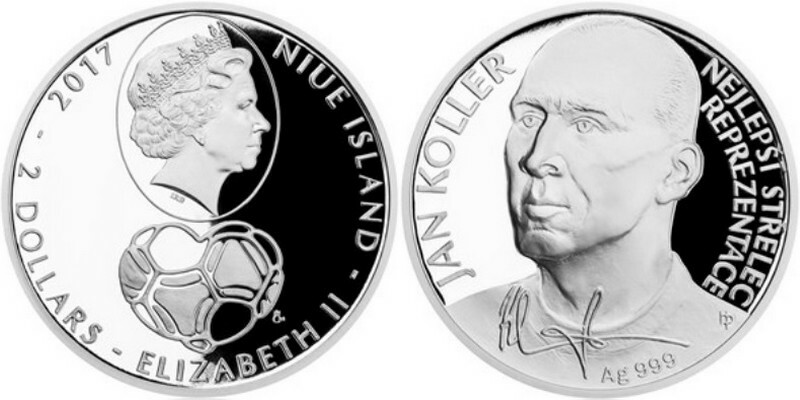 NIUE 2 Dollars 2017 – Soccer player Jan Koller – 29 g 0.999 silver Proof – mintage 500 pcs only – diameter 40 mm – price $65. NIUE 3 x 1 Dollar 2017 – Cipisek, Manka & Rumcajs – 3 x 10 g Argent 999 Proof – 500 exemplaires seulement – diamètre 30 mm – prix 36 euros chaque. NIUE 3 x 1 Dollar 2017 – Cipisek, Manka & Rumcajs – 3 x 10 g 0.999 silver Proof – mintage 500 pcs only – diameter 30 mm – price $41 each. NIUE 1 Dollar 2017 – Lys – 16 g Argent 999 Proof – 1000 exemplaires – diamètre 34 mm – prix 50 euros. NIUE 1 Dollar 2017 – Lily – 16 g 0.999 silver Proof – mintage 1,000 – diameter 34 mm – price $57. TRANSNISTRIE 10 Roubles 2017 – 25 ans de la tragédie du 19/06/1992 – 15,55 g Argent 925 Proof-like – 250 exemplaires seulement – diamètre 33 mm – prix environ 50 euros. Image Ehobbex. TRANSNISTRIA 10 Rubles 2017 – 25 years of the Bender Tragedy – 15.55 g 0.925 silver Proof-like – mintage 250 pcs only – diameter 33 mm – approx. price $57. Picture Ehobbex.